Players learn to recognize pairs adding to ten. Click below to download this printable addition game. 193kb, pdf. The Hex Ten game can be played following the rules for two players or as a puzzle for one player. We have a game creator tool for you to use to make games to study any topic that you can put into one of our charts. This is free at this time. I need to monetize it. How would you prefer I do that? We have a poll on Facebook if you want to voice an opinion. Please scroll down to buy our printable games if you have more money than time. Members have free unlimited access to all of the "Shared Games"
Here are the last few games (of over 45) that are SHARED so far with members as of February 5th ...ADD yours! a game using your unique information. (16 games $7) and is offered here separately. Players collect letter/ word/ image sets matching the answer key. (13 games $7) and is given here separately. using the divisor or quotient (use divisor when studying one family). Click below to purchase this Printable Phonics board game. Players love to read their way around the board listening for their sound. Plus nine pages of Bonus Games – three more board games, consonants only. This font makes sense to me. It is the way most adults end up writing most letters. Our printed fonts rarely match our handwritten text. "I wasn't taught this way,” but the more I think about it the more I like it. I do sell the plain font also. Match: a “139” card, a “140” card, a “141” card, and a “139, 140, 141” card. a “141” card, and a “139,140, 141” card. This GoFish game (472kb) uses the numbers between 50 through 999,999. I also have a level I that works with 1-12 number cards for easier practice. 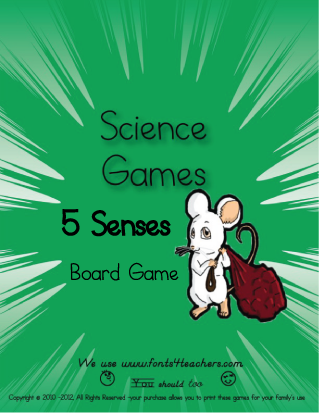 then read around the board until they match the sense they have picked or spun. Students may play with cards or the spinner, and check their choices with included answer key. Click below for your copy. This single game is included in the Multiplication Games Level One (I) set (15 games $7) and is sold here (@Currclick.com) separately. I use Gotcha as an introduction to a new concept. Usually, the information is written in a specific order on the answer key and players just collect the cards in the same order. In this Gotcha game (288kb) players are collecting the 2 multiplication family in sequential order. 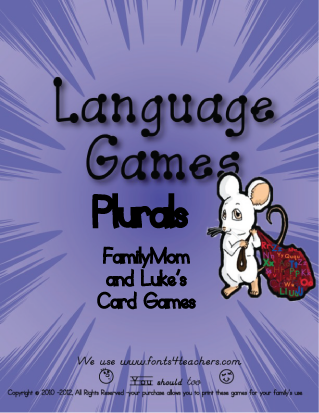 This week you get rules to play two printable card games, playing and studying with the same Plurals cards. ~Luke's Card Game is similar to “Golf,” only with 6 cards, which makes it a catchy, very quick paced game. I recommend playing/studying with 5- 10 pairs for each game. Fewer if they are unfamiliar, more if this is drill or affirmation. 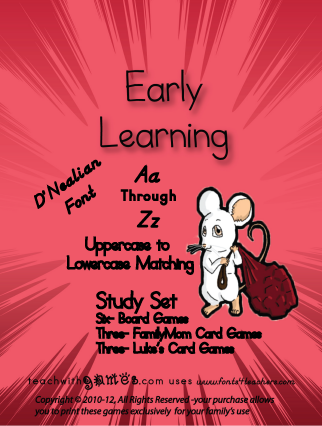 This single game is included in the Phonics Games Level Two (II) set (16 games $7) sold here (through Currclick.com). This is our traditional board game where you spin a spinner or draw a card then move your marker around the board. Our phonics board games are created using typical words found on phonics list. This is a great option as a phonics game for second grade. It is most beneficial if a student reads their way around the board listening for “their” sound. This a phonics game from our Phonics Level Two set. G, C, PH, Y, GN MatchIt Card Game, you may click below to purchase the 406kb, PDF or use our Game Creator to make one with your phonics words. This single game is included in the Phonics Games Level Two (II) set (16 games $7). Players must match the sound or color of the top card of the play pile. The goal is to be the first to play all of your cards. which makes it a catchy, very quick paced game. Click below to download your copy. It is best to include a couple of familiar problems with the new material. Purchasing building materials, changing feet to inches, or deciding how many dozen cookies to bake, learning to multiply by 12 is practical for everyone! This single game is included in the Multiplication Games Level Three (III) set (13 games $7) sold on this site and through Currclick.com. Luke's Card Game is similar to “Golf,” only with 6 cards, which makes it a catchy, very quick-paced game. This set includes two single-player activities. I created the answer page so that it would print on an address sticker page (Avery, 30 on an 8.5 X 11" page) So you can print them and stick them to a clothespin/paper clip or if printed on plain paper you could cut them apart and students clip the answers to the 'question shape'. Players collect two correct parts of a sentence and the definition of a word in the sentence. Prepare by printing on card stock or construction paper, cut on solid, bold lines and fold on dotted lines. Instructions are included. Print the key on the back, or without. 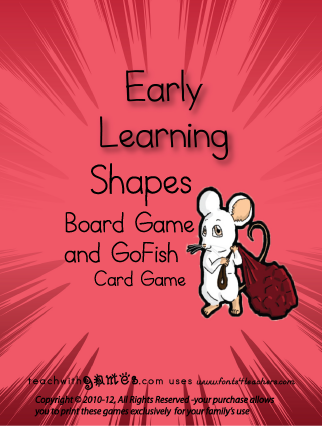 Includes 30 cards to play and study with. "Easy Roman Numerals GoFish Game"
three card games studying numerals up to 192. This single game is included in the Phonics Games Level One (I) set (15 games $7) and is offered here separately. This is another fun way to practice reading phonics charts. Students read their letter in a word with each vowel sound, each turn. Players use the game cards or the spinner. Fun practice for anyone that wants to sharpen these specific phonics sounds. (15 games $7) and is offered here separately. 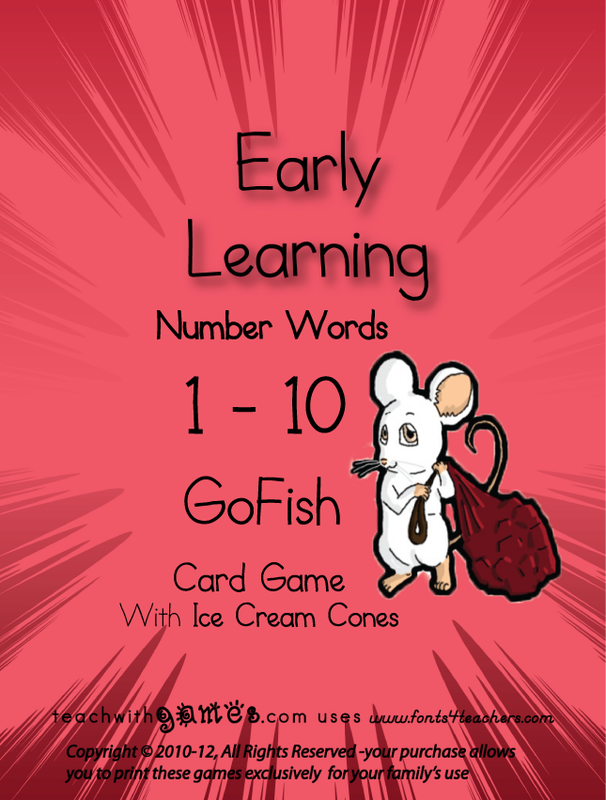 Players collect sets of a letter, a picture, and word cards for each of the consonants; played with the traditional GoFish rules (included), most sets win. This game is available in (this one is) regular print or D'Nealian Font. Use the game to study factions~ 1/16 to one whole. Do you remember learning about fractions? Let's try to make this a better memory for your students. Players draw fraction cards to fill their game boards. (3/8 and 5/8 can be added for advanced players). PS. I am not an SEO wiz but, we really need the traffic... Please visit us often. For a limited time, our Members get these 5 additional Printable Games for joining. Join for free today! Click "Create an Account" on our homepage. This Proverb is the theme for this site. As a teacher I found it to be a primary truth. In my college 'How to teach' Science class, I was required to create 80 games to enrich and support my chosen curriculum. The professor was sold on this idea and when I started teaching and used them I was convinced that I needed to make games for each of my subject classes. 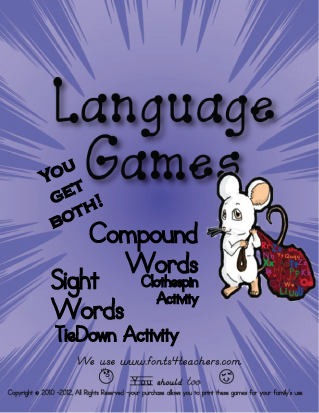 I had hundreds of games in my classroom, each reinforcing the concepts I taught. This ‘Gotcha game’ style is the game to use when you have a sequence to memorize. I use it with math families, poems, scriptures, dates (on a timeline) and more. It plays similar to Solitaire… with friends. 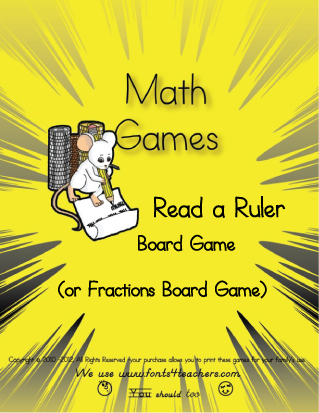 Enjoy this free printable game! Select the Sequence Chart and then fill in your information. Just add one or more words into each space on the sequence chart. This single game is included in the Multiplication Games Level Two (II) set (15 games $7) and is offered here separately. Players take turns drawing a card, solving the problem, and moving to the correct space (# of the divisor, 2, 3, 4, or 5). To prepare for play, print at least 3 copies of each game card. Include at least one Gotcha (wild) card for each complete week or year. Use more Gotchas for a quicker and easier game. Most of our games at teachwithgames.com are played by the rules of common games. This one is similar to Solitaire, only tweaked to play with friends. With all of our games, you may allow students to glance at the key for help for the first game or two depending on the level. Rules are on the board and two answer keys are included with cards. This single game is included in the Multiplication Games Level One (I) set (15 games $7) and is offered here separately. Players simply collect the cards in the correct order. Reaffirming the fact that zero times anything equals zero. Players face each other with the board between them or the boards can be cut apart. The faded numbers on the side make it quicker to see the score... the number of spaces left at the end. 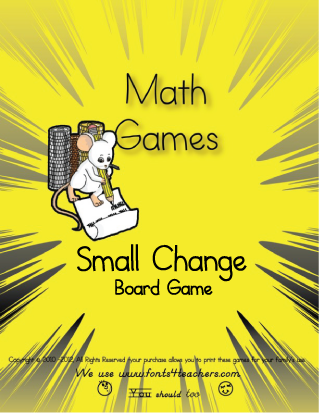 This game introduces and demonstrates the concept of multiplication. (15 games, $7) and is offered here separately. This game shows six ways to prove a multiplication problem. 1. 1 x 2 = 2. 2. 2 x 1 = 2. One turn for each player equals one round in this game, five rounds equal to one complete game. Players earn tokens for each round they win. Players take a road trip (in their head) collecting countries from Panama to Mexico. Require correct spelling to add challenge to this game. Money usually gets more attention than we want it to, but let's use it for an educational benefit. I use Gotcha as an introduction to a new concept. The information is written in a specific order on the answer key and players just collect the cards in the same order. 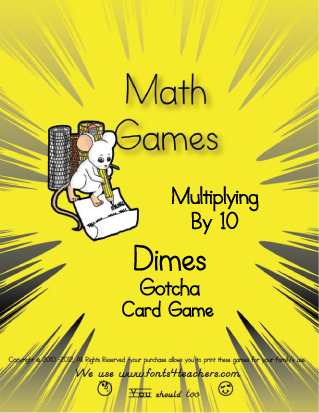 In this Gotcha game players are collecting the 10 multiplication family, using dimes, in sequential order. Players combine the sound on the board with the sound on the spinner or card. Players use the game cards with a die or the spinner. This same game set comes in plain (this one is plain) and D'Nealian fonts. 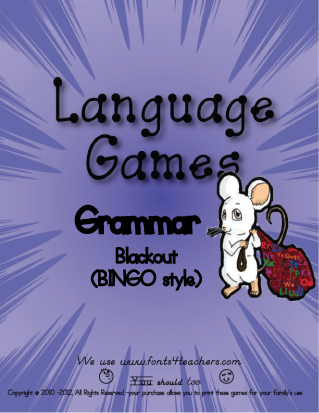 This game will give practice reading b, l, m, and t words with short vowels only. T, B, L, M Board Game is included in the Phonics Games Level One (I) set (15 games $7) and is sold here separately. Players may use the game cards or one of the spinners. This game is also available in a D'Nealian font. Yes, you could make these games up yourself. Don't, your time/energy is worth more. For a dollar, these are ready to print and play. Please use your time playing with your kids. This game helps us correct several common mistakes (15 different words). Help players learn the correct usage of words like lay, sit, sat, badly, good, beside, and besides. This file includes four different game cards for players to use and the answer key. Prepare the game by printing out a game card for each player and two “Call/ Answer Cards.” Cut one of the “Call/ Answer Cards” apart to use as call cards. If you place the “call cards” on the key as you call them, you can use the key to check the winner's card for mistakes. Students collect sets of three sequential number cards and the summary card, for example, a 1 card, a 2 card, a 3 card, and a 1, 2, 3 card. This GoFish game uses the numbers 1 – 12. I also have a level II that works with larger numbers for the advanced students. Reading these short vowel sounds correctly is important. If this does not come easily, it may help to think of a three letter word that makes the sound and just leave off the end. Players say sounds, not complete words. I use gotcha as an introduction to a new concept... the answers are shown. The information is written in a specific order on the answer key, players just collect the cards in the same order. FamilyMom is like “Old Maid” (only better). At the end of the game, the FamilyMom card holder is the winner. I also included the Old Maid card, so you could play that game too. FamilyMom rules are included, all three games- FamilyMom, Old Maid and Luke's use the same playing cards. Variety helps memorization, but your students may find a favorite. 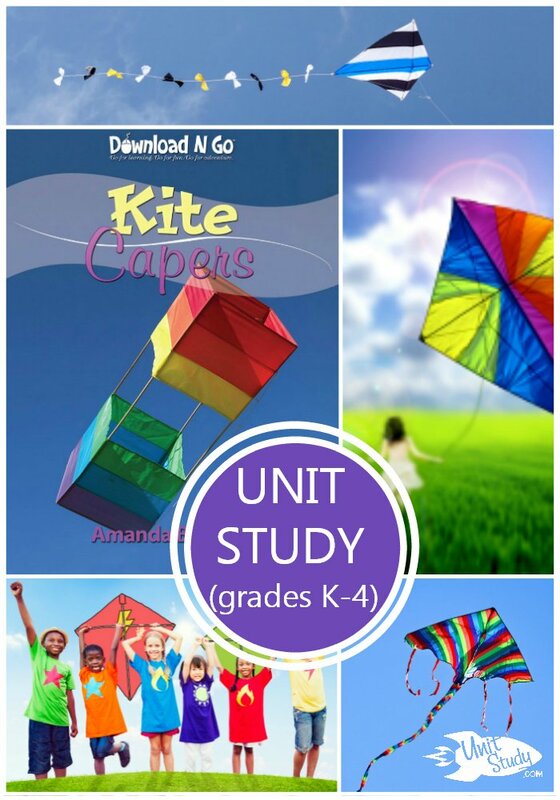 This PDF includes the word label, the outline, and a picture for each of six shapes. Students collect pairs, matching the numeral cards with the object cards, for example, two smiley faces on a card with the numeral 2 card. 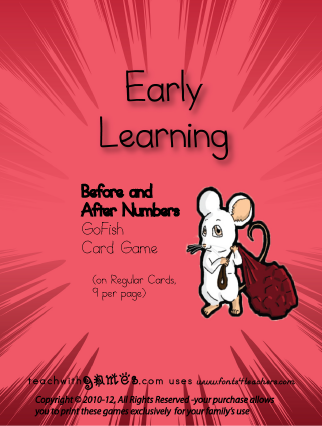 This game was created using our early learning size cards (six per 8.5 by 11 sheet) and includes both FamilyMom and Old Maid cards and rules. Players match the first vowel (aeiou) or whether the first vowel in the word is short or long. Long vowels are red. Match the color red (long vowels) or black (short vowels) or the vowel itself (a, e, i, o, u) either long or short. The Word Cards can be used with the game rules for MatchIt, FamilyMom or Luke's rules. This single game is included in the Multiplication Games Level Two set (15 games,$7) and is offered here separately. FamilyMom is similar to Old Maid except the extra/last card is the FamilyMom and its holder is the winner. I did include an "Old Maid" card too, just in case you prefer that version. Teachwithgames' games include answer keys. Before students 'know' the answers, using the keys help them learn. Most players want to look at the key at first, but as they play they use it less and less so that the game goes smoother/ quicker. Also, using answer keys help students at different levels play together. This single game is included in the Phonics Games Level Two (II) set (16 games $7) and is sold here separately. This is our traditional board game where you spin a spinner or draw a card then move your marker around the board. Our phonics boardgames are created using typical words found on phonics list. So it is most beneficial if a student reads their way around the board listening for “their” sound. 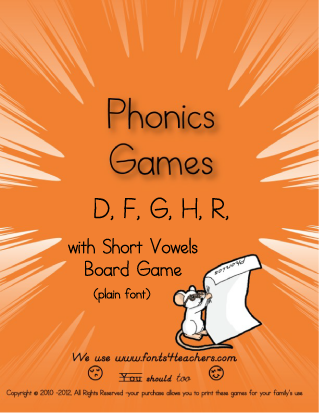 This single game is included in the Phonics Games Level Two (II) set (15 games $7) and offered here separately. Players may use the spinner or the category cards to play this game. You could use the game cards to play MatchIt (even more fun if you have the extra cards from another MatchIt card game). Find the rules for MatchIt under 'GAME RULES' on the top menu. All of the parts, rules, everything needed to play Stephanie's Spinner Game is included in the PDF. Here's the word list (key). really math help for any grade. It is best to include a couple of familiar problems with new material. 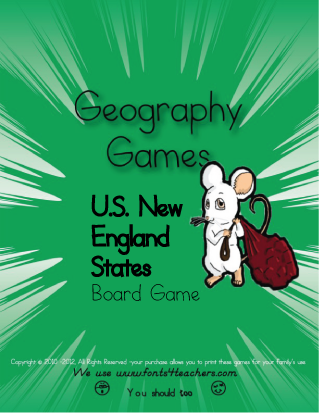 I have always lived in the midwest or the southwestern United States and wanted to make a fun way to learn (and teach my AZ students) the states in the northeast part of our country. Players may use the spinner or the game cards. students practice collecting sets, matching the numeral, the number words, and the number of objects. This GoFish game uses ice cream cones as the objects. These games are included in the Phonics Games Level Two (II) set (15 games $7) and are offered here as one file. Players must match the sound or color of the top card of the play pile. The word cards can be used to play other card games that match categories. The first level studies I – IX (1 – 9) and the second level studies numerals >10 up to 108. Check the answer key pictured below for details. We have a Roman Numeral Level two set that has a board game and three card games studying numerals up to 192. This game is included in the Roman Numeral Level II set. 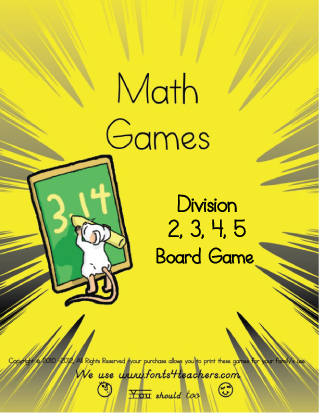 This single game is included in the Multiplication Games Level Three (III) set (13 games $7) and is offered here separately. FamilyMom and Luke's card games use most of the same cards. All of the rules we use are on the website under "GAME RULES." Players clip “dough” and “nut” to the image of a doughnut...and fourteen other words to their seven images. Players read (if someone listens) and alphabetize 40 sight words. This file includes two tiedowns with 20 words each. This Compound word Activity practices combining words that create compound words. A player clips words to the image of a compound word with paperclips or clothespins. The word page may be printed on an address label page (3 columns, 10 rows) so that 'word stickers' could be attached to the clothespins. The paperclips or clothespins can be used to attach the words to the image page. It is best if the image is printed on card stock. DIY- Use our Game Creator to make your own unique game for Free. Players guess if the next card will be greater than or less than the current card. PS. If you copy paste this information from this page, you could create this game with the game creator in less than 5 minutes. Really, Why buy? I use gotcha as an introduction to a new concept. Usually, players collect the cards in the order on the answer key. In this Gotcha game, players are collecting the 7 multiplication family in sequential order. with answers - students read the card as they play it, gradually replace cards or refrain from looking. This game is included in "Adding and Subtracting 1 FamilyMom and Luke's Card Game Set"
This single game is included in the Phonics Games Level One (I) set (16 games $7) and is offered here separately. We have two free games to help you memorize the 10 Commandments. Both games are included in the PDF below for $0.00, free. Select a Chart and then fill in your information. Just add one or more words into each space on the chart. 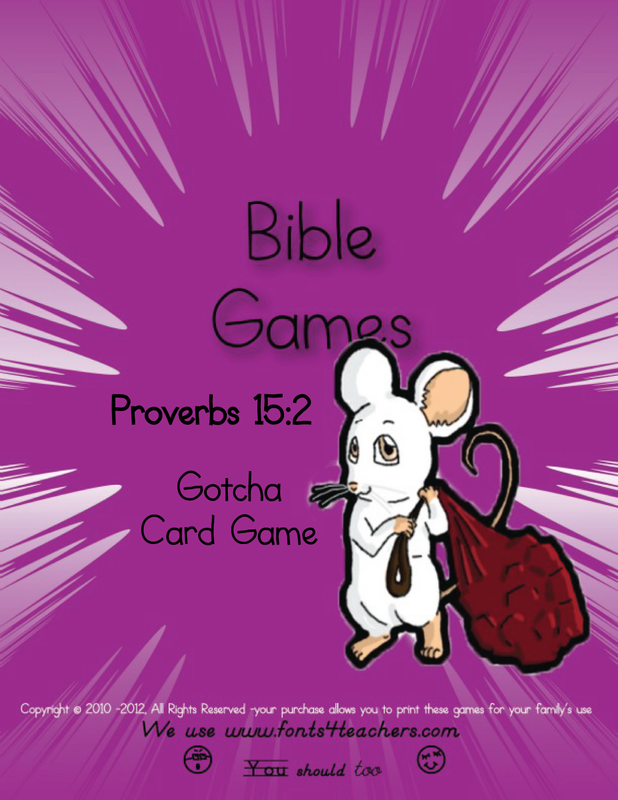 DIY Video help under our "Game Rules"
FYI: The sequence chart works well for memorizing scriptures. Place one or a few words in each blank, select the 'Gotcha Card Game', it plays like Solitaire with friends. This single game is included in the Phonics Games Level Two (II) set (16 games $7) and is offered here separately. This game study's two sounds for the "wh," as in wheel and in whole, plus the other sounds. Players collect sets of cards. For example, a 97 card, a 0 hundreds card, a 9 tens card, and a 7 ones card, make one complete set. The game includes 10 sets, totaling 30 cards, rules and answer keys. For additional practice, use play money to pay for your opponent’s sets. This file includes 52 game cards plus the FamilyMom and Old Maid cards. I use five pairs and copy to make = or >20 cards. We also have a level two set that has a board game and three card games studying numerals up to 192. This game is included in the Level II set. Now you can make your own custom Printable Educational Games for your family and share them with friends. Members may use our Custom Game Creator Tool, in the "MY GAMES" tab at the top. Add your information from a review sheet, upload images, or make text up in your head, fill in the chart, and push a button to create a game. We are not advertising this yet. Here is our first attempt at explaining "How to make a game using the Pairs Chart." warning we are not pros yet. You have nine different card games to choose from, all of them have video examples in the "Game Rules" Tab at the top. The video above only shows the "pairs" Chart and games. AS a Member you can use ALL of the Member's "Shared Games"
With our free membership, you get access and use of our Custom Printable Card game creator. 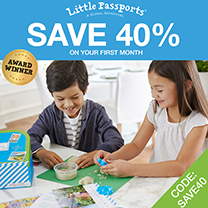 Place your unique information in a chart, select a game, print, play, and enjoy or let your children enjoy memorizing the information.